Just when it seemed that the North Korea nuclear issue might cause a US-China collision, Secretary of State Rex Tillerson’s visit to Beijing brought a backing away. News reports rather blandly suggested that mutual understanding and professions of friendship were the main outcomes. Xi said all the right things: “China and the US absolutely can become very good partners in cooperation,” their common interests “are far greater than their differences,” and “cooperation is the only correct choice.” Tillerson, according to Xinhua, the official Chinese news agency, said: “The US would like to develop the bilateral relationship with China based on the spirit of no conflict, no confrontation, mutual respect, and win-win cooperation; unceasingly increase US-China mutual understanding; increase US-China consultation and cooperation; and together deal with the challenges they face in international society” (Renmin ribao, http://politics.people.com.cn/n1/2017/0320/c1024-29154633.html). Chinese observers seemed to think the visit was a win for China. Tillerson supposedly acknowledged what Obama did not—“mutual respect” in the spirit of Xi Jinping’s 2010 proposal for a “new type of great-power relationship” with the US. 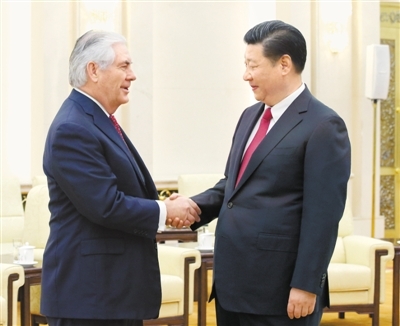 To the Chinese, Tillerson accepted equality between the US and China, which they interpret to mean recognition of China’s “core interests” that include Tibet, Taiwan, and the South China Sea islands (People’s Daily Online, http://en.people.cn/n3/2017/0320/c90000-9192372.html). Some US commentators evidently agree that Tillerson gave away the store, accepting the Chinese world view while getting nothing in return (www.washingtonpost.com/world/in-china-debut-tillerson-offers-reassurance-receives-praise/2017/03/19/62094abc-0c66-11e7-8884-96e6a6713f4b_story.html). Of course we do not know what was said behind the scenes, or what was on Tillerson’s mind. Since he deliberately left all reporters from the major media outlets behind—“I’m not a big media press access person,” he confided—we may have to wait a long time before finding out. I frankly doubt, however, that Tillerson “caved” and simply parroted Xi’s great-power formulation. If Tillerson was overly accommodating, it may be because he was wanting to smooth over Trump’s undiplomatic tweets in preparation for the upcoming Xi-Trump meeting in Florida. What Tillerson’s visit means for dealing with North Korea is even less clear. The Chinese want the US to get back to the bargaining table, believing that the “North Korea problem” is for the US and South Korea to solve. Washington keeps trying to make the problem China’s too: “China has done little to help!” said Trump as Tillerson was en route. “Help,” of course, means undermining the Kim Jong-un regime, which China is not about to do. Nothing that has come out of the Tillerson meeting with Xi suggests that common ground has been found on North Korea. If US policy toward China is now “results oriented,” as the administration insists, Tillerson’s diplomacy doesn’t show much beyond polite promises of cooperation. The Chinese obviously don’t want war on the Korean peninsula, but they are no more prepared now than in the past to jettison the Kim regime despite having substantial misgivings about it and imposing modest sanctions on it. Chinese leaders are also probably convinced that a war between North Korea and the US is unlikely despite all the tough talk. The proposal of Foreign Minister Wang Yi prior to Tillerson’s arrival for a “double suspension”—North Korea suspends its nuclear and missile tests in exchange for US and South Korea suspension of their military exercises—is dead in the water. In truth, freezing the current situation is not a bad deal for either side, though even if Washington and Seoul had agreed, China’s ability to deliver on a North Korean suspension is doubtful. That leaves the Trump-Xi summit as the next best opportunity to come up with a common approach on North Korea. Don’t bet on it, however. Unless the US is prepared finally to accept that there are no military solutions to North Korea’s nuclear ambitions, Washington must support China’s position that only diplomacy can constrain Pyongyang—and that the US must take the lead in moving back to the bargaining table. Mel, Seems you are saying that China assesses the military risks on the Korean peninsula as being reasonably low and the feasibility and advantages of pressuring or incentivizing Kim to retrench on is strategic nuclear ambitions as being low as well. If so, why should China consider using its oil purchasing cards or its banking facilities to influence North Korea. If I’m correct, isn’t the US’ wish to prevail on China basically a lost cause? It seems to me that improving US-China bilateral relations should, therefore, be decoupled from North Korea. Hopefully there are other things for the two countries to negotiate. What do you think? The Chinese don’t want to add to US pressure on NK by supporting deep sanctions–first, because Beijing is just as fearful as all the other parties about how NK might react if it’s back is to the wall; second, because Beijing doesn’t want to be seen as engaging in regime change. For those same reasons, the frequent US calls on China to rein in NK fall on deaf ears; the Chinese will only go so far with sanctions, and also know they cannot force Pyongyang to do its bidding. Still, if Washington were to return to the negotiating table, positive US-China relations would make a difference, I believe–specifically, in crafting a deal (such as happened at the Six Party Talks in 2005 and 2007) that might be palatable to NK and put the nuclear and missile issue on ice for so long as the deal works.